It pays to be a member of CASE! One of the benefits of being a CASE member is ever so often you get a surprise gift in the mail! On January 18, we mailed everyone who was a member of CASE on Dec. 15, 2016 a copy of our hottest selling book right now: "Great Instruction, Great Achievement" by John L. O'Connor. This book has been a huge seller for us since we unveiled it at the Fall Conference in September. What we have also noticed is when someone purchases it, they come right back and double their order! So, read your free copy and then get back to us for additional copies — for a limited time with a 10 percent discount! This book will make a huge difference in your student achievement — and isn't that what it is all about! Because the mailing is done in bulk, you may not receive your book for a week or more — contact me if you haven't received it by Feb. 1. We will do some checking — it could be your let your membership lapse! Not a member of CASE? Why not join now so you don't miss out on the next FREE book or any of the other great reasons for being a member of CASE! Mental Health was the number one professional learning need according to the CASE Board of Directors. It just so happens the main topic of our Winter Hybrid Conference Feb. 23-24 is Mental Health! You tell us your needs and we try to meet those needs! Now — we need you to step up and register for the 6th CASE Hybrid Conference. Just think about the weather or what it might be like the third week in February — wouldn't you like to be on the warm, white sugar sand beaches of world famous Clearwater Beach, Florida, participating with your colleagues, learning about mental health in the schools and catching up on legal issues? The Sheraton Sand Key is an amazing hotel and a rate of $199 during the height of the season is amazing — but that group rate ends this Friday, Jan. 27! Which of these options is the best for you? Remember, the hotel group rate for the onsite option is only good through Jan. 27! So you need to get your room soon if you decide the beautiful white and warm beaches option is the one for you! If the Virtual site is best for you, then when you register, we will send you the hints and a customizable flyer so you can advertise your site to those you want to attend. Who should attend? You can invite different people for each of the two days or invite some of the same for both days! Counselors, assistant principals, teachers, up and coming administrators, community mental health providers, school board members-you decide! But as many as you can fit in your location and all for the low price of one registration! Our Speakers are the top in their field and will have great immediate take-aways for you! Don't miss this opportunity to make a huge impact on your school, district, region in the area of Mental Health and Legal issues! Speaking of great take-aways! Did you know CASE has the highest percentage of Premier members of any of the divisions? If you are a Premier member or if you have a District Membership, you receive FREE Webinars from CEC — are you taking advantage of these? If not, why not?! The list of webinars that are recorded and just waiting for you to use is growing! If you have any questions on how to take advantage of your membership benefit, just email or call CEC Constituent Services (1-888-232-7733)! Speaking of CEC... Boston is going to be lovely in the spring! Have you taken advantage of the early bird registration fee? It will be available for only a little while longer so be sure and get registered! The CEC convention in Boston is going to be amazing and a wonderful place to hear the cutting edge resources you need to take back to your district! CASE will have lots of fun and meaningful activities going on during the convention! Mark your calendar to purchase your CASE Night ticket on Feb. 1 on the CASE website! These tickets typically sell out so get yours early! The price of the ticket will include dinner and a great visit to the New England Aquarium! 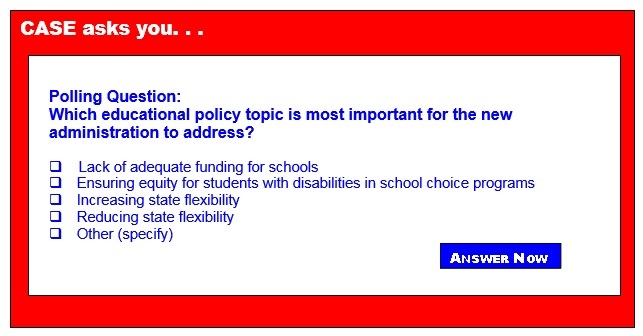 The question last week was "What do you consider the greatest problem with voucher programs?" This is a big question and the answers will help CASE Policy and Legislative Committee update our position on Vouchers. First place with 21 percent was a 3-way tie: Public funds going to private schools; Increase racial/ethnic/class inequities; and Other — which was basically, all of the above with the exception of the answer that said there were no problems with vouchers. By the way, that answer — there are no problems with vouchers — got no votes! At second with 14 percent of the answers was no student outcome accountability. Third place at 7 percent was again a 3-way tie: Lack of funding accountability; parents forfeit the right to FAPE; and Re-segregation of students with disabilities. If your state does not have this issue, you might want to read up on it as it looks to becoming an especially big issue with the new administration. Thank you for all you do every day, every week, all month, and throughout the year! Restorative practices are related to community efforts to improve policing and serve as an alternative sentencing for juvenile offenders. Family group conferencing is a "restorative" procedure that can be used in schools to bring the people together who were negatively affected by a behavior. In schools, this conference would focus on the expectations identified for the school environment, and the problems created by violations of those expectations. It might bring together teachers, administrators, psychologists or counselors, representatives of the student body, parents, the "victimized" student(s), and the "offending" student(s) to discuss and teach appropriate behavior and consider appropriate consequences. This is intended as a way to "repair" the harm which occurred in the school as a result of the behavior. Preliminary evidence shows that this can be an effective alternative to expulsion for students with serious behavior problems. For the ease of our prospective applicants, the Department is extending the deadline for the applications for the 2017-2018 School Ambassador Fellowship to Monday, Feb. 6. As before, the application can be found on our website. We ask for your assistance in sharing this information as broadly as possible via your staff and member networks. Thank you in advance.